Drugs that counteract blood coagulation are referred to as anticoagulants. Those drugs aim to prevent blood coagulation and the formation of blood clots. Blood clots or thrombi are small, coagulated blood components that are not part of the wound healing as plugs but, instead, float freely within the blood. The reason why blood clots can be dangerous lies in their ability to migrate even into the smallest vessels, block them and thereby prevent the nutrient supply via the blood stream of the respective organ. The results are possible pulmonary embolisms, myocardial infarctions or strokes. Within the normal population, anticoagulants are more commonly known as “blood thinners”. However, this name is incorrect since blood is not thinned, but instead, anticoagulants make it more difficult for thrombocytes to stick to each other and thus prevent the forming of (in the worst case lethal) blood clots. Anticoagulants inhibit the formation or the effect of coagulation factors. 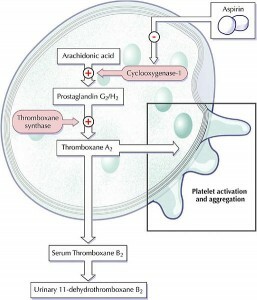 Antiplatelets (thrombocyte aggregation inhibitors) inhibit the clotting of thrombocytes. Which type of anticoagulant is to be used depends on the underlying disease of the patient, his/her age, accompanying illnesses or risk factors. Possible incompatibilities with certain anticoagulants have to be excluded in the anamnesis prior to administration. The advantages and disadvantages for each individual patient have to be considered. Heparin and Coumarin belong to the group of anticoagulants. 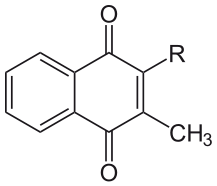 Coumarin and coumarin derivatives are used to inhibit blood coagulation of a patient over long periods. Coumarins inhibit the vitamin-K dependent formation of the coagulation factors IX, X, VII and II (keyword: 1972), which are produced in the liver. Therefore, this vitamin holds great importance in the process of blood coagulation. As a result, coumarin derivatives have an effect in vivo (in the living organism) only. They do not work in vitro. Coumarin derivatives are administered orally and develop their full effectiveness after two to four days. This is because the coagulation factors that are already in the blood have to be degraded by the organism, a process which takes some time. Heparins already show their effects a few hours after administration and are, therefore, used as preferred treatment, e.g., after surgery, to prevent thrombosis. Heparin is a glycosaminoglycan and inhibits the formation of thrombin from prothrombin in the secondary coagulation cascade. Physiologically, heparin is contained within the body, inside basophilic granulocytes, inside the liver and inside mast cells. Heparin has two mechanisms of action. It increases the effect of antithrombin III, our body’s strongest anticoagulant, by approx. 100 times and also plays an important role at inhibiting the coagulation factor X. As mentioned above, besides the body’s own production, many other clinical situations determine whether or not heparin is given to a patient. In hospitals, heparin is used as anticoagulation therapy and is administered to the body externally. Parenteral subcutaneous administration is frequently used for the prevention of thrombosis, which often occurs in immobile, bedridden patients after surgeries. Apixaban is administered orally in tablet form twice a day. It is a direct reversible antagonist of the coagulation factor Xa, which is responsible for converting prothrombin into thrombin. 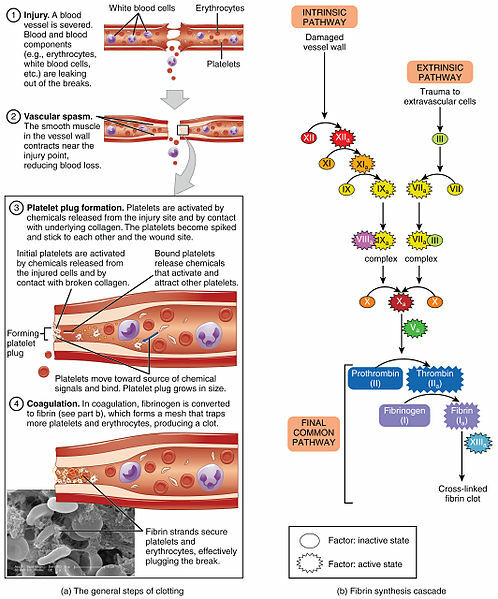 Once thrombin cannot be produced anymore, all further steps of the coagulation cascade are stopped, and the formation of a fibrin net has successfully been inhibited. Therefore, the red thrombus that is used for closing a wound is formed very slowly or not at all. Since 2011, this drug has been approved as relapse-prevention within the European Union for patients after hip or knee replacement surgeries, strokes, pulmonary embolisms and atrial fibrillation (these indications also apply to the further listed anticoagulants). On average, the effect of Apixaban lasts for 12 hours and is metabolized afterwards by the body. 75 % of this metabolism takes place biliary (via liver and bile) and 25 % renally (via the kidneys). The substance is rendered harmless for the body and then excreted. Compared to the administration of heparin via injection, the oral administration of Apixaban is much more comfortable. 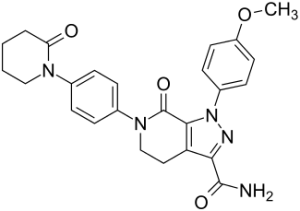 Dabigatran is an oral anticoagulant, which is involved in the inhibition of thrombin on a cellular level. Dabigatran is administered as inactive precursor, Dabigatranetexilat, which is converted in the liver and blood plasma in its active form via hydrolysis. Within the coagulation cascade, thrombin is responsible for activating fibrinogen, which synthesizes fibrin under the influence of the coagulation factor XII. 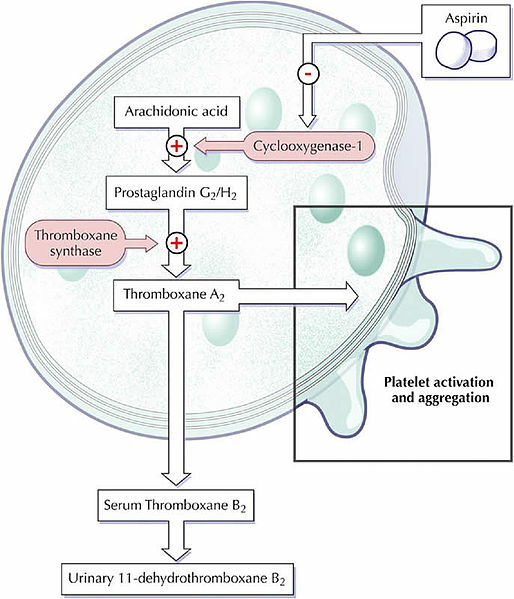 Dabigatran also inhibits platelet aggregation in primary hemostasis. The metabolization and excretion take place via the kidneys, which clean and filter the blood and then excrete the remaining substance with the urine. Dabigatranetexilat is therefore not suited for patients with renal insufficiency. Rivaroxaban is also a direct antagonist of the coagulation factor Xa, which is taken orally in tablet form. 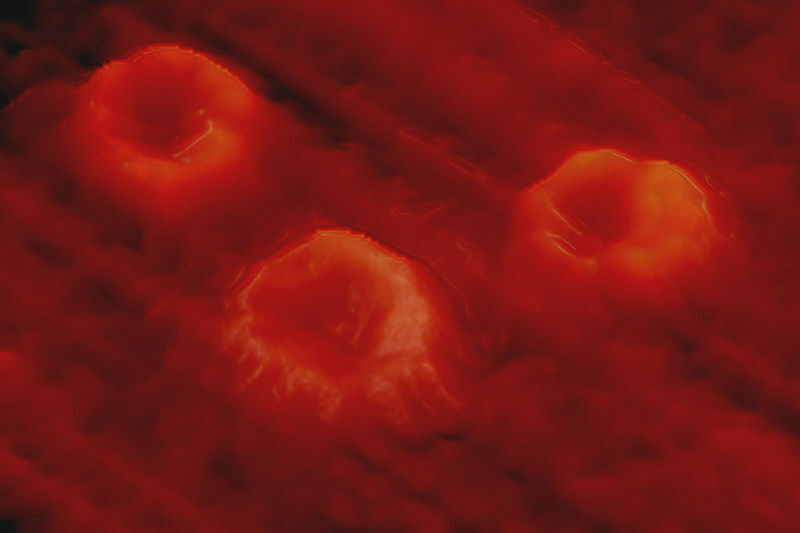 Due to its interference with secondary hemostasis, the oxazolidinon-derivative has no effects on platelet aggregation. Therefore, the primary wound closure remains intact. However, the wound is still fragile and can be opened easily, since the formation of the final fibrin clot is prevented by the interference with secondary hemostasis. Rivaroxaban is reabsorbed rapidly by the villi on the epithelia of the small intestine, and the concentration of the drug in the plasma is available within a maximum of two to four hours after administration. Marcumar is a vitamin K antagonist and inhibits the γ-carboxylation of glutamate. This prevents the synthesis and secretion of the coagulation factors X, IX, VII and II. Both primary and secondary hemostasis are restricted greatly. Marcumar is also known as Phenprocoumon, and it is administered orally in the form of tablets. In chemical terms, Marcumar is a connection of 4-Hydroxycumarines. Antiplatelets, also known as thrombocyte aggregation inhibitors, are used to counteract the aggregation of thrombocytes. Compared to anticoagulants, the effect of antiplatelets is much weaker. That is why those substances are not primarily administered after, e.g., surgeries. They are frequently used for patients who have already suffered from myocardial infarction or stroke, to prevent or reduce the risk to suffer from another infarction. Antiplatelets are, for example, dipyridamole, clopidogrel and acetylsalicylic acid (ASA). Aspirin is part of almost every medicine cabinet in households all around the world. Whether it is about headache or pain in the neck region, menstrual or dental pain, fever or a simple cold – aspirin is the “superstar” amongst painkillers and, therefore, usually the first choice when it comes to symptom relief. The OTC-availability of this painkiller in pharmacies is currently a hot topic among the general public. The discussion centers around the issue of a responsible treatment of patients with this drug. The WHO (World Health Organization) has already put this medicament on the list of essential pharmaceuticals in 1977. The advantages of the active agent acetylsalicylic acid lie in its diverse qualities: It has an effect as antiplatelet as well as an anti-inflammatory (antiphlogistic) effect. It acts as pain reliever (analgesic) and lowers fever (antipyretic). The exact mechanism of action as well as further information can be found in another article on arachidonic acid derivatives. The benefit of anticoagulants is, at the same time, their largest drawback that can lead to severe problems if it occurs at the wrong time. Anticoagulants do not completely disable the blood coagulation, however, initiation of the coagulation process as well as wound closing or wound healing is delayed significantly. In the case of more severe cuts or similar damages, the body is threatened by an enormous blood loss, which can be lethal under certain circumstances. Therefore, it can be necessary to add vitamin K or coagulation factors to stop blood coagulation in extreme situations. The administration of vitamin K can be conducted, e.g., in droplet form directly under the tongue. Histologically, the mucosa in this area consists of non-keratinized squamous epithelium, which facilitates the entering of the substance into blood-carrying regions. This makes it possible to achieve the effect in a relatively small time frame. Altogether, the intake of “blood thinners” poses an increased risk of long-lasting nosebleeds and bleedings of the gum. A small injury of superficial epithelium through fingernails, toothbrushes or other sharp objects can result in long-lasting bleedings. These side effects are to be considered as rather unproblematic. Frequently occurring nose- or gum bleeds, larger hematomas, red urine or dark red to black stool are also signs of side effects. The painful feeling of sudden, severe headache in combination with dizziness and visual disturbances can be signs of the greatest risk of anticoagulants: cerebral hemorrhage. A medication pass (dt. Medikamentenschein) should always be available. The disease and the medication is documented in this pass, which makes it possible to consider one’s personal situation in case of possible following treatment measures in the hospital. That way, complications and interactions with other drugs can be avoided. It has to be considered that medications used for other therapies in combination with anticoagulants can lead to interactions. These interactions can either increase or decrease the effect of anticoagulants. Such medications should only be administered after consulting with the attending physician. Possible effects of interactions can be, for example, gastric hemorrhages. As already mentioned, vitamin K is a substance that promotes blood coagulation. Cumarin acts by forcing vitamin K out of the liver or inhibiting its synthesis. Many foodstuffs like, for example, cabbage, spinach, calf’s liver, regular quark, mushrooms, tomatoes, beans and peas are rich in vitamin K. However, a diet rich in vitamin K can decrease the effect of medicinally administered vitamin K antagonists. That is why patients who take, for instance, Marcumar should not eat large amounts of cabbage or other foodstuffs mentioned above, since the preventive effect of another possible stroke is thus no longer present. However, to not eat any of the above mentioned foods is also not recommended. Vitamin K deficiency, which is frequently observed in infants and in cases of dietary changes or malnutrition, leads to a prolonged bleeding time. Vitamin deficiency disorders are considerably more rare, since vitamin K is contained in many foods and can also be produced by the intestinal flora of the organism itself. A balanced diet is recommended. In addition to this, the intake of antibiotics over long periods poses a risk since antibiotics destroy the gut bacteria. Patients with hepatic diseases, diseases of the gastrointestinal tract as well as cancer patients are a risk group for vitamin K deficiency disorders. …have no effect on blood thinning. 2. 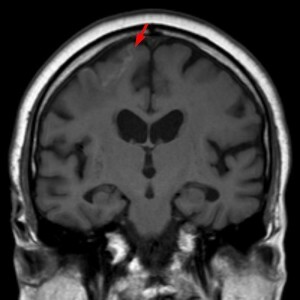 Which indication requires a therapy with anticoagulants? Vitamin K is produced in the liver. Fibrin activates the coagulation factor Xa. 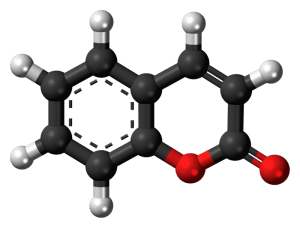 Coumarin derivatives inhibit vitamin K dependent coagulation factors. 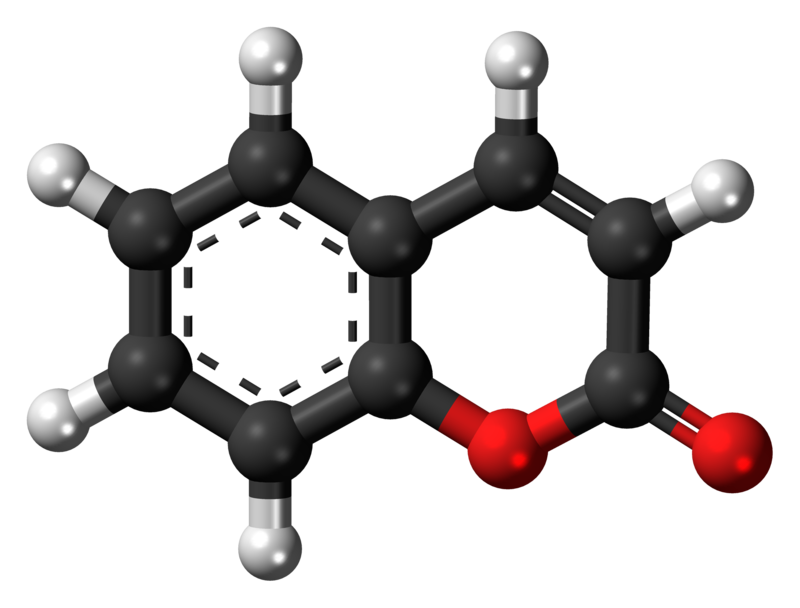 Heparin is synthesized in basophilic granulocytes and mast cells. Goodman, L. S., & Gilman, A. (1970). The Pharmacological basis of therapeutics: A textbook of pharmacology, toxicology, and therapeutics for physicians and medical students. In Levy, J. H. (2014). Anticoagulants. Philadelphia, PA: Elsevier. Richardson, J. (1961). Anticoagulants. London: Medical Recording Service Foundation. Trainex Corporation. (1978). Anticoagulants. Garden Grove, CA: Trainex Corp.